Does anyone else in AnimeSuki forums play Weiβ Schwarz? If you do play Weiβ Schwarz, perfect, because I can't find anyone who plays Weiβ Schwarz (in Victoria, Canada). For rules on Weiβ Schwarz visit http://ws.nk-ds.org/index.php/about/. I made a facebook group to connect players, set up matches and possibly organize tournaments. The group already has a 3 players in Malaysia and again is for anyone to join and play. A link to the facebook group is in my signature. As of now I'm playing with Nanoha StrikerS themed trial deck. 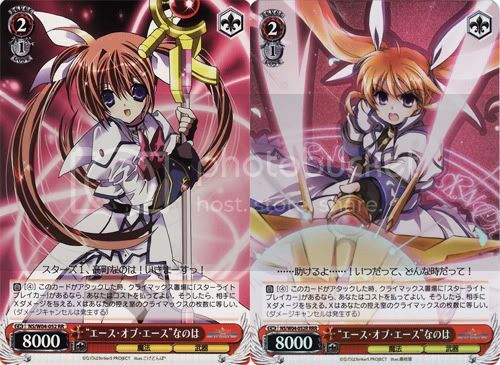 In the future, I'm hoping to create another deck focusing on Nanoha StrikerS (with Subaru and Teana). I have no cards, but I am kind of interested. ATM I'm thinking about getting something like two trial decks for testing the game out. However, I am hesitating to buy the Japanese ones because the first trial deck is already available in English. I'd prefer English cards so I don't know if I should wait or not (since the other cards might or might not get translated). I have several cards from the Clannad sets but none of them seem to be translated yet and they're listed as "extra packs" on the site so I have no idea if I could even make a deck with just them. I hope they plan to release more in English. Not a fan of Disgaea at all and it'd be pretty awkward to have to reference a translation sheet every time anyone plays a card. I'd do it but sadly my friends are not as patient. Well, you definitely could since a deck only requires 50 cards and not more than 4 copies of the same card. Yeah, I'd prefer other sets as well. I haven't played Disgaea yet (but I plan to), so I don't know any characters and therefore I'd rather not buy it now. As for translations... well, I am playing another Japanese card game and even succeeded in convincing some friends to play it, too with help of translations. Even when some of them were hesitant in the beginning, they quickly got used to it (since you remember all card texts after a while). Also, decks in Weiß Schwarz TCG have a lot less different cards so it should be quite easy to play even without being able to understand Japanese. I'd probably make it anyway, if it's Clannad I'd play it even if it were the worst deck ever. Yeah, my friends and I all play Magic so learning the cards quickly wouldn't really be that big an issue most likely. It's more that I'm the only one interested in anime and the fact that they couldn't easily read the cards without an outside reference would be just one more thing convincing my friends to not try "this weird anime girl card game". I only watch the extremely short anime for this. It's funny. Having a translation sheet for your deck isn't that bad. You just have to be organized with it . It's more that I'm the only one interested in anime and the fact that they couldn't easily read the cards without an outside reference would be just one more thing convincing my friends to not try "this weird anime girl card game". I wouldn't be too sure about Weiss Schwarz being a "weird anime girl card game". They have Sengoku Basara, Persona 3, Persona 4, and King of Fighters. I have a feeling if Weiss Schwarz is ported to North America. They will licence more anime, manga, game series into Weiss Schwarz. Well, the main factor is luck followed by how you prepare your deck. A trial deck can win against a "loaded" deck (worth $150 Canadian or > $400 Ringgit). In malaysia at Comic Fiesta 2009, someone with a trial Nanoha StrikerS deck, like I'm using, came in top 5 if I'm right. The first season made me think, "what the hell!?". The second season survive looks promising since they finally have a few Nanoha StrikerS, Fate/Stay Night and DC. If anyone is interested, I want to try playing Weiss Schwarz over the internet. One thing for sure is, we'll need a webcam and a lot of patience. Go to the facebook group in my signature, at the moment the group is mainly Malaysian. Hmmm it looks like this game lacks non-character cards (i.e trap cards for Yu-Gi-Oh or mission/command cards for Gundam War). Looks a little too much on the simple side for my tastes. Oh wait found them, they're called climax cards. Alright starting to look a little more interesting now. The card power levels seem a little on the random side though. Last edited by Kaioshin Sama; 2010-01-25 at 04:48. I already bought the cards but i have not played it yet because i cannot read the text lol. Translations are not complete either so for now it is just being kept in storage. Yeah, I get that, but my less-than-open-minded friends wouldn't, which is why I put that in quotes. Sadly those series would not convince them otherwise either; in fact I think they'd likely label Persona and King of Fighters the exact same as Nanoha and DC. If I were to play I'd probably just look for other opponents and not even try to convince them. I'm not sure I like the idea of luck being the "main" factor though. Of course it's always going to be a factor just by the nature of card games but I prefer strategy or deck building ability to be the main factors. If a game is based mainly on luck, I don't really feel like I've actually done anything to make myself win and that pretty much defeats the entire purpose for me. In a game like Magic or WoW, someone playing a trial deck against a real deck piloted by a veteran player would need luck on the level of the titular character of Saki to win, and in some cases I'd go as far as to say it would actually be impossible unless the opponent was trying to lose. I guess this would technically benefit me as I don't plan to spend a ton of time and money on this game but I still prefer to feel as though it was my skill rather than my luck that won me the game. Speaking of loaded decks though, do you have a link to a price guide for this? I doubt any of the cards I have are valuable but I'd like to check just in case. The climax cards help your characters or you either by increasing power, soul (used to add card to their clock, after 28 cards in clock, once lvl 4 they lose) or quickly draw cards needed by you. The translation is a bit broken but for someone like me who knows enough Japanese to survive in Japan, it's wonderful as a reference. What is your focused series? I see, well everyone is different . Luck can be placed in many forms, preparation for an event or so forth. I jumped for Weiss Schwarz because of Nanoha StrikerS ha ha and with the movie cards coming out. I'm thinking of buy a large booster pack for StrikerS and extra packs for Nanoha The Movie First. I don't know any price guide sites. I'm assuming, your best bet is to look for a Japanese website with the price of each card. 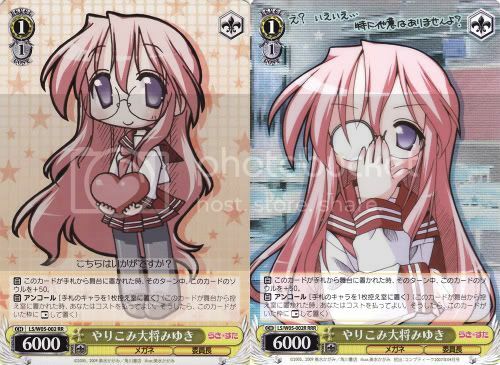 Oh yes, if you look at the bottom card, you can tell if it's a Rare card, Trial Deck card, Common card, etc. I hope that the Japanese one and the English one stay the same. The way you say it sounds like the English TCG will get series the Japanese did not/will not get. That said, I think if Weiß Schwarz gets completely translated and localized in the US, it would be a 1:1 port. And that is actually also what I am hoping for. Actually, I am still a bit sceptical about the gameplay of this one. Well, it's already been said that luck is a big factor in this one, so... yeah. As for design, I am - to be honest - a bit disappointed. While a lot of cards look good and use official artwork, sometimes they seem like "screenshots", if you get what I mean. Like a character card of Tohsaka Rin in which she actually is being held by Berserker and blowing his head with her jewels away. Yeah, my thinking is kind of similar. However, I think I will still try it out. My expectations aren't that high, actually; this will probably be a card game I'll play every now and then with few friends just for fun. I doubt that I'd want to play on any competitive level. Here is a site that sells Weiß Schwarz single cards. You shouldn't take every tagged price as the rightful price, but for reference it's pretty good. I've been using it along with other sites to look up card prices for Lycèe TCG cards for some time now. Or you could just scan the cards and make a set with MagicWorkStation. Then you wouldn't even need the real cards outside of getting the images of them. Heh, that's pretty funny, I guess I do actually have a couple valuable ones, namely this. Can't check for sure since I'm at work atm but I'm actually fairly certain I have 2 or 3 of them. Wish I could read what her ability actually is. It's probably extremely good because she seems fairly weak based on just card power. She's probably good for supporting? "When this card played from your hand to the stage, draw 1 card and choose 1 card in your hand to discard to the waiting room." In short, she is probably good since this game seems to be based a lot on your luck and cards like these help to decrease your need for luck. I've read more or less everything and it sure sounds interesting (I've played Magic and still playing Yugioh, so WS concepts aren't too different in some instances, but radically different at times). 1) is there any method to increase your stock cards aside of card effects? As far as I can see, the lvl0 cards are quite cheap, but often without any effect. But some of them still have a special ability that require at least 1 stock. So how are you supposed to use their abilities? I must have missed something I guess. 3) Regarding the attacks, can you declare an attack against your opponent's backline if they have no frontline, or are you forced to perform a direct attack here? As for the side attacks, do you have to minus the soul damage with only 1 of the frontline characters, or all of them? (assuming the opponent has 2 frontline characters and 1 border free). Ha, I had a feeling she'd have something to do with drawing cards, since that is always associated with "intelligence" in other card games and tends to be an ability that makes cards good/valuable. I've only skimmed the rules for the game so far but a free character who filters a card when she comes into play seems really good, I know it definitely would be in the other games I play. It seems like it's a lot easier to get cards out of the Waiting Room in this game than it is to get them from the Graveyard in Magic so she actually looks even better. Although, wow, I can't believe a common is worth that amount unless it's a limited edition or long out of print. Would definitely explain why I have 3 out of just a few packs though. Each time you declare an attack, you reveal the top card of your deck. Depending on its color, you can have to perform various actions like drawing a card or give your attacking character +1 soul etc. Afterwards, that revealed card goes to your stock slot. Yep. The only difference is that your character remains "tapped" in play while Magic does not have this restriction AFAIK. You can only choose to attack an opposing character right in front/adjacent of/to the character you're attacking with, so no back row. You have to imagine your character sneaks past the opposing character standing right in front of him. So his soul value only decreases by the level value of the opposing character adjacent to him (meaning the one in front of him in the front row). It seems like it's a lot easier to get cards out of the Waiting Room in this game than it is to get them from the Graveyard in Magic so she actually looks even better. AFAIK extra packs (so not regular booster packs) are only printed like once and never reprinted again in Weiß Schwarz. And since Clannad happens to be an extra pack, its cards might be limited and therefore even more valuable? Yeah, that usually requires basing the deck around it though and using very specific cards. If I read the rules for this correctly it looks like cards can have the ability to bring a character back from the waiting room as an attack trigger despite normally doing something entirely different. Seems a lot more versatile and like it would show up a lot more often, unless there aren't very many cards that actually have that trigger ability. Oh right, the trigger. I totally forgot, as I was more or less focalised on the result of trigger (top right trigger that is). Interesting as the game pretty much encourage attacking switfly, yet it will cost dearly with reckless attacks. Though, doesn't it mean that the player who goes first has an overwhelming advantage? He would definitely get a free trigger with a +1 soul damage. Even though it will be a lvl0, that is bluntly a severe blow. Sounds pretty logic here. And what if the opponent character is in rest mode? Can you still attack it, or you are basically going through? From my perspective, it seems the rest mode is just there to prevent a card to attack a second time and/or after using an effect that require the character to be tapped.